BASF’s Ultrason E and P resins are amorphous, high temperature-resistant, transparent thermoplastics based on polyethersulfone (PESU) and polyphenylsulfone (PPSU), respectively. Ultrason polysulfones’ key features are good dimensional stability over a wide temperature range, high stiffness, high mechanical strength, excellent hydrolysis resistance and very good fire, smoke, and toxicity (FST) behavior. Their extraordinary property spectrum allows them to be used in high-quality technical components and heavy-duty products. Ultrason E and P polysulfones can substitute for themosets, such as epoxy and phenolic resins, other non-recylable duromers, metals and ceramics. Ultrason resins can be processed with all the methods known for thermoplastics. 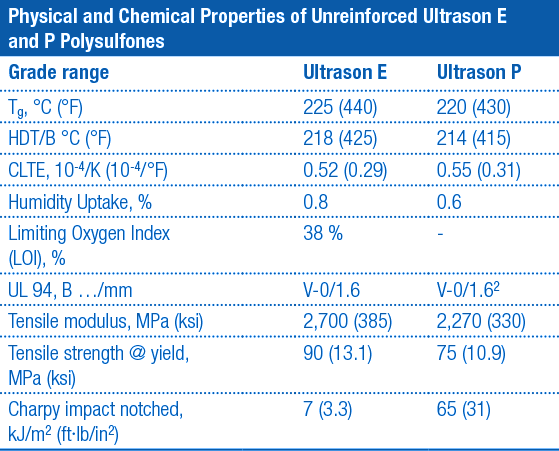 Ultrason P and E polysulfones exhibit a set of material properties which makes them unique among all thermoplastic polymers. They feature very high glass transition temperature (Tg) and heat deflection temperature (HDT) as well as very low coefficients of linear thermal expansion (CLTE). Their short term temperature resistances and long term usage temperatures are the highest among the amorphous high temperature thermoplastics. Due to inherent flame retardancy, materials made from Ultrason E and P polysulfones are in compliance with the stringent global regulatory requirements requiring low heat release, smoke generation, and toxic gas emissions. While Ultrason E polyethersulfone exhibits the higher HDT and stiffness, Ultrason P PPSU excels in terms of low humidity uptake and balanced mechanical properties. Its toughness is best-in-class of all high temperature thermoplastics. Common processing methods for Ultrason polysulfones include, but are not limited to injection molding, extrusion, and thermoforming. Typical machining and postprocessing methods, such as laser, ultrasonic, and vibration welding, can also be utilized. By virtue of their thermo-mechanical characteristics and favorable FST behavior, Ultrason E and P polysulfones are particularly suitable for aircraft applications. A broad selection of unreinforced and reinforced grades is available. ​Unreinforced Ultrason polysulfone grades are available with different viscosities for injection molding and extrusion processing. They cater to a variety of applications such as injection molded components, sidewall panels, galley cart components and skins for sandwich materials. They also are being used for rapid prototyping. Due to its inherent heat resistance, Ultrason E PESU is suited as an impact modifier for high temperature epoxy resin. For ease of incorporation and compatibility, it is available as a micronized, hydroxy-terminated grade. Reinforced grades are based on Ultrason E PESU and excel through their very high stiffness. Glass fiber and long carbon fiber reinforced sheets are materials of choice for seating and structural components. A product line of foamed core materials has been developed based on Ultrason E PESU. The combination of lightweight characteristics, excellent mechanical properties and regulatory FST and heat release compliance predestines Ultrason foam for aircraft interior applications, in particular as a honeycomb replacement.